When George Lucas started to make his dream film project called at that time "The StarWars" come true, he needed some visualist, who could help him to design a universe that was supposed to look totally strange, but also totally realistic in a "lived-in" sense. He found this in the person of Ralph McQuarrie, who had earlier on been an industrial designer for the Boeing company. George Lucas wanted one of the planned "droid comedians" to have a definitely non-human shape. This rather late scetch from Ralph McQuarrie show a lot of the details of the R2-shape already defined. He was at first supposed to roll on one big ball bearing, later to walk on two legs. To make him look even more unusual, a third leg was added in the middle. 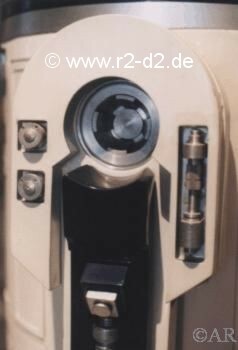 The "batterie packs" at the inside of the feet were already present, as were the two horizontal arms at R2´s front. The legs had a different shape and the arm at the head was later deleted. There are two tales surrounding the creation of the name "R2-D2". The first, and oldest, story is that George Lucas was doing the editing on American Graffitti, and was a bit tired in the evening, so he tried to shorten his work by not calling for "Reel Two, Dialogue Two", but for "R2-D2". This version was narrated in the Making of The Empire Strikes Back. When the Annotated Screenplays came out however, Lucas personally corrected this story and said that all names in the movies were selected just to have phonetically pleasing and easy-to-speak names. After the shape had been decided upon, the SFX wizards had to find a way to make R2-D2 move and behave like the director would want. This task was divided between Lucasfilm in California, who did the blueprints, and the local studio shop at the EMI/Elstree Studios in London, England. 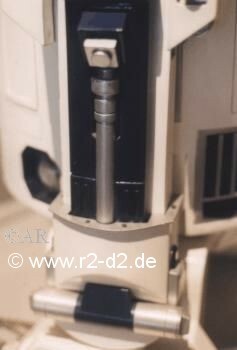 There, a company named Norank did build six Artoo units, and since at that time a lot of people from the aerospace industrie were working there, these R2 were mostly built of aluminum, including the legs. You can see this prototype in the picture out of the "Art of-book" at the top of this page, recognizable from the rivets in his upper body. 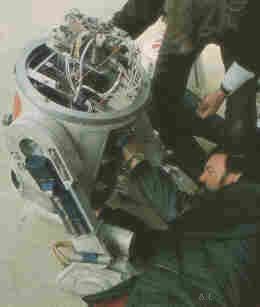 The man behind this first incarnation of Artoo-Deetoo was John Stears, the mechanical effects supervisor for StarWars. 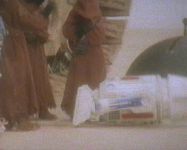 For shots showing Artoo moving around longer distances a radio controlled (RC) version was built. These RC-R2´s had little metal braces between the legs and the lower body to convey the loads of driving. Since radio-control technology wasn´t as advanced at that time as today, this RC-version would give the director and his crew a lot of trouble.Examples of this can be seen in the "Making of StarWars" video, where a "blooper" sequence shows several droid failures and breakdowns. 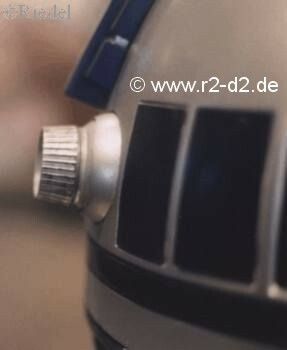 There were other R2-props for other occasions. One was built for scenes when Artoo extends his third leg. The third leg was pushed out by springs, while at the same time other springs would swing his body forward to move him to the three-leg-position. 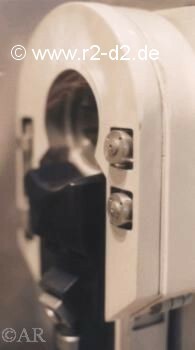 When the middle leg had extended all the way it was supposed to lock in place, but this locking mechanism seemed to have failed quite often, as can be witnessed in the "blooper"-sequence in "The Making of StarWars". R2 would then fall very ungraciously on his "nose". Ouch! R5-D4 falls rather ungraciously on his nose. This is probably the one R2-body that could do the two-to-three-legs stunt, and it was unsed for this scene. Obviously, the middle leg was supposed to be extended by springs or something, and then lock in place. Well, the locking doesn´t seem to have worked. 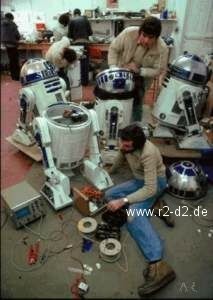 Very interesting scene for the do-it-yourself-R2-builder. Check the feet after the crash, they seem to be free-rotating. Probably released during the start of the sequence. Click left to see an original drawing of the mechanism for the third leg. Click here for the whole article from the UK Official StarWars magazine (229 kb). 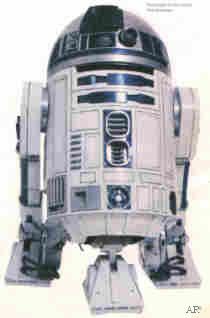 At the beginning of ANH, R2 (sucessfully) does the 2-to-3-legs thing and then rolls towards camera. In this deleted blooper scene, you see him bump into the right hand set. 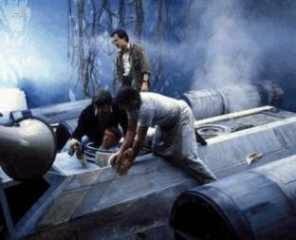 If you watch ANH closely, you can see that in the movie he would probably also crash into the (left hand) set, but there´s a quick cut to hide that. This droid, allegedly called R5-A2, simply stopped dead in its tracks during filming in Tunisia. 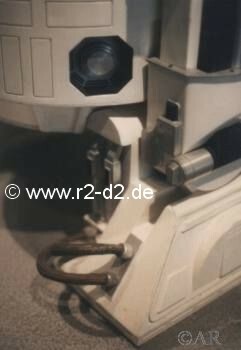 For close-ups of R2-D2 however, Lucas wanted to have more of the human-like ability to express feelings, so a human was supposed to be inside R2 and operate his head, the little moving eyes and wiggle R2 a bit around to show excitement for example. Only a rather small person would fit into the little robot, but the English actor Kenny Baker was found for this unusual job. 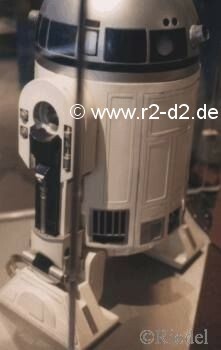 He would sit on a little stool inside the robot and have his legs stick into R2´s legs. 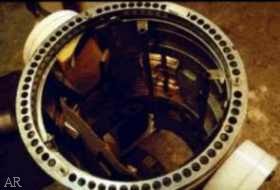 According to Baker, the prop had a lot of sharp edges and bolts sticking out on the inside of the body. There were two Kenny Baker - "suits" made for ANH. 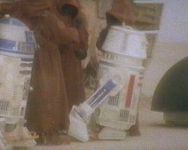 You can recognize the "Kenny-Baker-operated"-R2´s from the large flexible tubes running from the lower body to the droid´s legs. Kenny Baker can only be inside R2 when Artoo stands on just two feet. 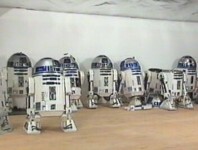 The three-feet-R2s were either radio-controlled or pulled on wires. These very interesting pictures show Kenny preparing for several scenes im ESB and a glimpse into his working space. 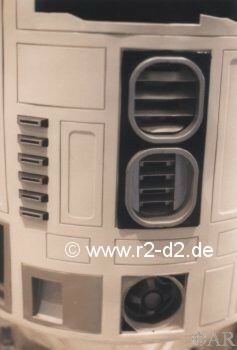 Another R2-D2 prop was steered not by radio control, but with wires used to pull the droid along corridors, the wire out of camera range. George Lucas admits in BTM that about 80 % of all the R2 scenes in ANH, he was pulled on wires. According to Anthony Daniels, the English actor who played C-3PO, he personally invented R2 turning corners without radio control: During the scene where C-3PO and R2 hide in the closet in the Death Star hangar control room, he had to say "Come on, R2", and then R2-D2 was supposed to roll a bit in one direction and then turn and roll towards the door. 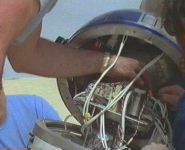 The remote-controlled R2 failed several times, so Daniels proposed to put a wire on R2´s feet, lead it through a loop and have one stagehand hold the loop, while another would pull R2 the first few feet. Then stagehand A would release the loop, stagehand B would continue pulling and R2 did indeed turn a neat corner! Among other clever tricks invented by Daniels was a thin wire attached to the computer interface arm and led though the wall socket to guide the arm into the socket. But Anthony tells these stories in a much funnier way; see his Wonder Column in the SW Insider #34. 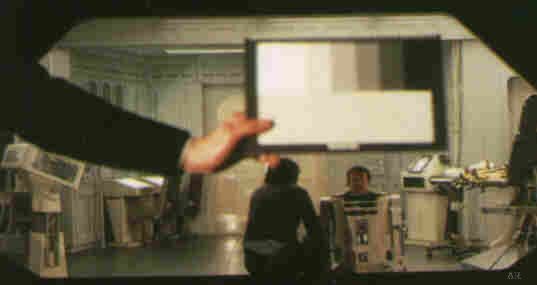 For the shots of Artoo in Luke´s X-Wing the problem of filming in front of a bluescreen arose. Since this special effects process removes everything blue from the picture, the blue areas on R2´s head would have been removed, too. In the final movie, these areas would have been transparent, then. So the crew had the solution of painting these areas black. This little trick could still be seen in all three classic movies. until during the restoration for the Special Edition they were digitally repainted blue again. 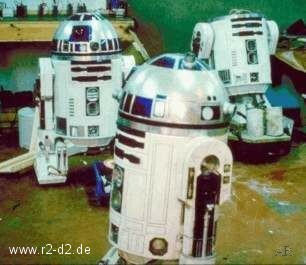 For the Empire Strikes Back, another 8 R2-D2s were built by a UK company under Tony Dyson. These were done in fiberglass. For Return Of The Jedi, no new Astrodroids were built. The SW Insider #39 contained a story about Don Bies, Lucasfilm´s head of the Droid unit on Episodes 1, 2 and 3. He narrates about several improvements that were made to the newly developed R2-props for the prequels. Among them were new motors (from electrical wheelchairs), new electronics to regulate these motors and a tiny camera inside R2 to allow the operator to see from R2´s point of view. The molds for R2´s legs seem to have been modified slightly. 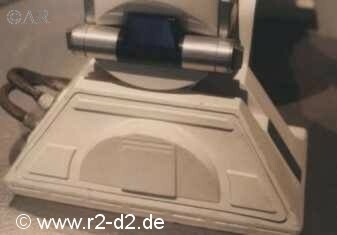 According to the "Bad Droid Carma" video, available on www.starwars.com or on the Episode 1- DVD, there was a "contest" started between the US (ILM) and the British Artoo workshops to create an improved droid that would work more reliable on sand or over sliding door thresholds. Both teams came out with similiar solutions and the result is now a much improved R2 that´s far more trustworthy than his "Classic"-era predecessor. 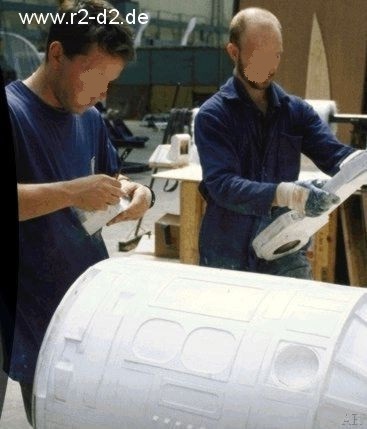 The British Episode1-Artoo is made of Fiberglass, while the ILM one was made from carbon fibers. According to starwars.com, the prop weighs "a couple" hundred pounds, about 100 kilograms. There´s also the great story about the droid controllers sitting in the stage rafters far above the set when one day George Lucas came in, and they all started to have their Artoos follow Lucas around the set, like a bunch of mechanical fans. 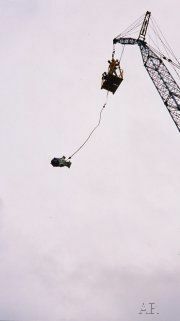 A spy in Australia send me this rather unusual picture of our little Astrodroid doing bungeejumping from a crane platform. 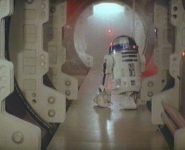 There were rumour that this might be part of the abovementioned "R2 falls off a Coruscant platform, but recovers with his rockets" scene that was at least partly filmed for EP1, but deleted. George Lucas has a tendency to re-use some of his unused ideas in later movies. 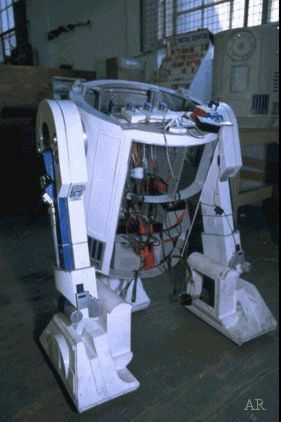 Example was the "R2-Electrocution" that was mentioned in the novel for ANH, but only later used in ESB. The most horrid revelation about this picture however, is the report that the filming ended with an intentional, fatal plunge without bungee cord !!! No animals were harmed in the filming of this movie, but what about droids ? Well, we learned now what this was about. 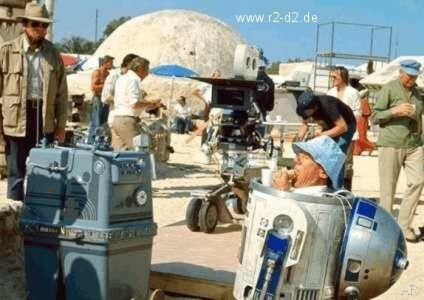 It was part of the filming for "R2-D2 Beneath the Dome", a great three-part Internet special that portraits R2-D2 as if he was a real Hollywood star, who goes through the usual (?) stages of extreme popularity and then alcohol and drug abuse. Extremely funny. The creative mind behind "Beneath The Dome" is none other than Don Bies, head of the ILM droid unit. "Beneath The Dome" has by now been released on DVD, although only in the USA. Generally, in the movie there were more computer animated sequences than in Episode 1. Pretty obvious are the "stair climbing" sequence, or the "flying R2 scenes in the droid factory. Only one scene in the movie was filmed with the Kenny Baker unit (the marriage scene at the end), all the other scenes were done with the remotely controlled R2s. 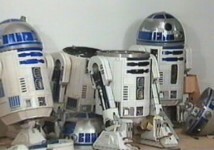 With the immense advances in CGI graphics, there were more and more of R2´s scenes overtaken by computer animated droids. 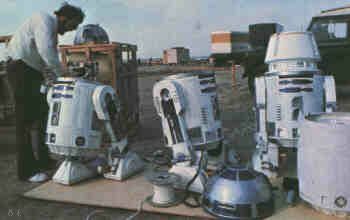 The obvious ones are for example R2s involvement in the space battle at the beginning.However, there were quite a number of the mechanical R2s used. 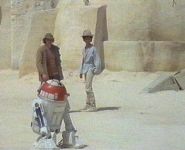 The Kenny Baker units were not seen in the final movie, even though Kenny Baker did get an honorary mention in the end credits. 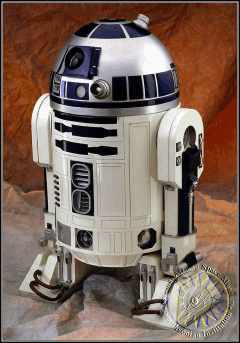 Right from the start, R2 was supposed to get a purely electronic, non-human voice. The challenge in creating Artoo´s voice was to create a voice that would sound electronic. robot-like, yet convey feelings and personality of this little droid. After experimenting with many synthesized sounds, Ben Burtt realized that another approach had to be taken. So he recorded human noises and sounds, modified them electronically and mixed them with some electronic sounds. The result are those individual Artoo-beeps that we all know. If you are looking for them, there was a CD available called "StarWars Triology CD-Rom" that contained thousands of sounds (and videoclips) from the classic movies. Among them are several digital R2-wave-files in very good sampling quality. Far better than most of the home-sampled waves you find on the internet that still have background noise. Try to find the CD at your favourite Internet auction. Or you look at the forums at astromech.net or the R2 builders Yahoo site. Artoo-Deetoo at the Air & Space Museum Washington, D.C. 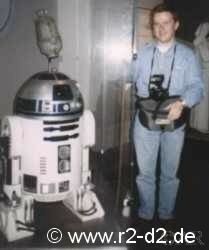 Finally on October 2nd, 1998, I was able to personally have a look at one of the original R2-D2 from the Lucasfilm archives. I was equipped with two cameras, a measuring tape and a paint comparison card. In the exhibition Artoo stood together with C-3PO, behind glass of course, and in a rather darkened room. These conditions made it not very easy to shoot good pictures, so forgive me, if they are not perfect. 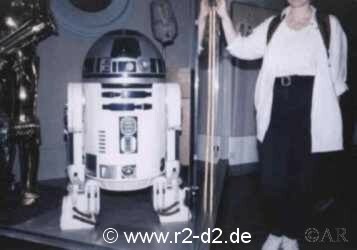 I was very glad to see that, although this R2 was in a much better shape than some others I had seen at Planet Hollywoods, he was not as perfect as he looks on the silver screen or even on pictures. He about compares in quality of finish to mine (I hope Don forgives me this), meaning that some doors don´t close too perfectly and that he already experienced some "space damage" . For many more pictures of this exhibition, check astromech.net; there´s a huge gallery of pictures taken at the Smithsonian.